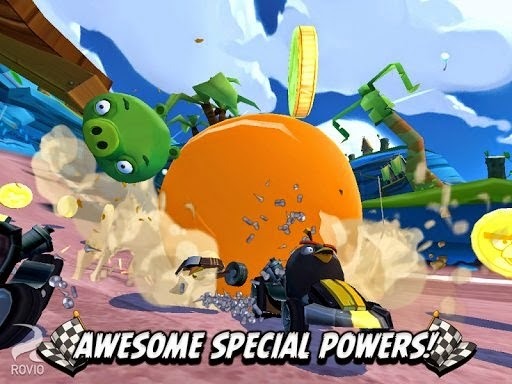 Angry Birds Go android game update with new tracks for the sub-zero episode and weekly tournament. Now you can enjoy any level of this game because when you go to weekly tournament you can play other levels and race to the top of the podium in a weekly tournament against your friends! Feel the rush as you fling those freewheeling birds and piggies down the track at breakneck speed with plenty of twists and turns in a thrilling race to the finish line. This is a very addicting racing game which you must race as the birds or pigs. Jump behind the wheel and race as Terence, Red, Chuck, Stella, King Pig, Moustache Pig and many other favorites. Let's play and test your skills with super fun and surprising game modes: Race, Fruit Splat, Time Boom, Champion Chase and Versus Mode! - New tracks for the Sub-Zero Episode. - Send lucky boxes to friends then hope you receive some back.